The poster-edition commissioned by the Goethe-Institut consists of a range of prints in split-fountain-printing-technique. 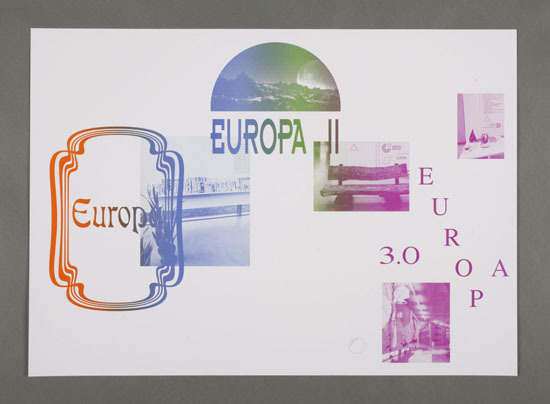 The set includes an image of a moonscape referring to extra-territorial speculations and fictions about Europe, a composition with quotes by the participating curators, a poster with the various typographic scenarios about Europe and the two signature badges for Europen. All these motifs were printed in a rare printing technique, in which inks are mixed on a single printing cylinder. Through the rotation of the cylinder the colour sections change their position slightly during the printing process. Hence, each print is unique. We make use of a standard industrial process of reproduction which is modified specifically to produce original variety.